If there’s one thing I relish as much as Lewis Archer loves a smooth Burgundy, it’s a glorious storyline written and performed with all the imagination of Audrey Roberts' “palace on water”. Yes, neither of them exist in reality, but Audrey took to regaling Gail with such gusto about her fictional fjord cruise that it seemed she began to believe herself to be aboard the Valley of the Stars, while I have most certainly been “piped on board” the Audrey-Lewis-Gail saga, lifeboats David and Claudia firmly appended, with no intention of docking. Yes, it’s the ship I’ve been waiting for. The captain’s oven has served up a divine dish, and it’s a joy to behold. When I read that Nigel Havers and Rula Lenska were returning to Coronation Street, I was sufficiently buoyed by the news. Aside from the fact that they were both an utter delight the first time round, it indicated the possibility of a leading story for Sue Nicholls, which was a very welcome proposition. With precisely that transpiring, the resulting storyline has been a sublime watch. When Audrey accepts Lewis’s invitation to visit him in prison, she hears the words she is hoping for from the cut-price Milk Tray man, to invoke Rita’s iconic slight. Professing himself reformed on foot of his love for her, and no longer wishing to be the person he was, he asks her to consider taking him back on his imminent release. To prove himself, he has had handed himself in for his role in Rosemary’s scam, and transferred £40,000 to Gail. But what is Audrey to do? Enter some sparkling Aud and Claud action as the pair consider the possibilities. Claudia is chock full of charisma, wit and confidence, and it’s a delight to have her floating about the cobbles again. It’s great for Audrey that she has such a friend to confide in, as given Lewis’s treatment of Gail, she is full sure of her daughter’s reaction in advance. This leads her to pretend she has won a Norwegian cruise so she can spend some time alone with Lewis when he’s released from prison. Gail instantly worries about Audrey getting seasick and chilly which nicely sets up the dynamic of an older mother and daughter, the latter fretting and the former wishing to be treated as an adult and desiring her own independence. While Gail’s disgust concerning Lewis is one element to the story which unfolds, the other sees her and Audrey’s relationship under the microscope, and it’s all beautifully done. As Audrey manages to keep the pretense afloat while she and Lewis have very much dropped anchor at Grasmere Drive, the story is a great source of organic, genuine humour, whether it’s David acting as a foil to Gail’s anxiety, or Audrey on the phone to her daughter pretending to be dining in the captain’s quarters with Abba while Lewis takes time out from his charm offensive to sit, engrossed, in some nautical millinery. Gail fretting about her mother being alone and the captain taking advantage only adds fuel to the fire of Audrey’s joie de vivre, to adopt Lewis’s parlance. It also offers a contrast between Gail’s perception of Audrey as weak, and the strong woman we know could cope in any circumstances. Lewis’s language and delivery are consistent sources of amusement and he must be a delight to write for. The fact that he's so at odds with his surrounds offers great opportunities for humour, and Audrey’s increasingly girlish reaction to each delectable syllable as her caution begins to fall away is a joy to watch. With all calls now being ignored over at the good ship Grasmere, it’s a genuine delight to behold Audrey thoroughly enjoying herself and opening up like a flower through the magnificent Sue Nicholls. Establishing if Lewis is being sincere is actually not as important as what else we’re witnessing; Audrey discovering what she wants and needs to bring her happiness at this time in her life, and asserting her independence and right to make her own decisions and choose the way she wants to live for herself. Waters become choppy, however when Gail learns of the scrappage of the very cruise liner Audrey is supposed to be on, and goes to Grasmere Drive to investigate only to behold the pair through the window. Sadly, Gail’s inability to forgive and refusal to accept Lewis, or actually listen to her mother, sees her give a ‘me or him’ ultimatum. Audrey chooses Lewis, and it has all been played such that we can understand why rather than judging her choice. Further, we’re encouraged to rejoice with her in making a decision for herself. I loved her declaring of her pending nail appointment, “Hollywood Red is the order of the day”. The humour, which has worked consistently well throughout, reflects Audrey’s desire for lightness in her life, and we’re spoiled with a delectable apology from Lewis in Roy’s where a bemused Claudia looks on as he’s threatened with the wooden spoon by Carla and Mary sits, rapt. Meanwhile, desperate Gail’s final attempt to make her Mam see sense, as she sees it, is via an intervention at the salon. This is also a source of great comedy with David asking “How long do interventions take? Because I want to get over to the Rovers to see how Jenny’s ruined it”, and Emma hopping out midway through from her hiding place in the back. Gail remains consistent while David bears witness with a more balanced outlook. Accusing Gail of resenting her having a life apart from being a mother, Audrey asks, “Let me be happy and make my own decisions, my own mistakes. All I ask is that you let me decide who are my friends when I’m not with you, and don’t lock me up if you don’t like the people I’ve chosen.” With David considering that fair, the intervention is over. The final confrontation happens in the Rovers following the delightful counterpoint of Lewis’s solo entrance. With Gail announcing, “So this is it. Your choice. You choose a conman over your own daughter.” it gives Audrey the chance to point out publicly that Gail created the ultimatum, not her, and that she’d rather have both of them in her life. Also, while Gail’s understandable, yet superficial, view of the situation might easily be shared by others, by making it Audrey's story, we know that her real choice is happiness and that whatever the outcome, her victory lies in having the strength to take a risk for it, accept the consequences, and be her own person. The crucial thing is that it’s a decision she has made for herself. This storyline could not be better in my eyes, and is very much one I have been waiting for. We have been treated to top quality performances, scripts, comedy, pathos and heart with sublime pace and timing, and I’ve loved every minute of it. Encore, Corrie! Encore! Really well written and an interesting read. I think Lewis will ultimately let Audrey down, so I can understand where Gail's coming from...but after voicing her concerns, Gail should have shut up and let Audrey decide for herself what she wanted to do. Gorgeous and heart-felt blog post, Emma! And I happen to agree about this well-coiffed trio, all with good hair, coming to the forefront of the show now. Cut-rate Milk Tray man is a phrase that satisfies the ears. I don't believe a word he has ever uttered, but his presence always delivers buckets of humour for us, and likely tears for several women in the end. And we get to hear the Audrey noise more often! I really enjoy Nigel Haver's performance. His look, mannerisms and voice are just perfect. However I just find Rula Lenska odd with her vast amount of hair and strange voice. Well written. I don't necessarily agree that we are encouraged to rejoice with Audrey. It's a poor decision made by a selfish and gullible woman. A man tried to destroy Gail's mental health. That is not forgivable. I don't really enjoy Rula Lenska. I enjoy Nigel Havers, but the ongoing cons and gullibility are a touch ridiculous. There is simply no evidence for anyone on the Street to trust Lewis. And his treatment of Gail re Richard Hillman was beyond cruel. I don't see how Audrey could overlook such cruelty in his character, even if she could forgive a financial con game. Gail did try to take Lewis from Audrey. Wasn't that kind of a bad thing for her to do? I agree with Shells: when Lewis came back into Audrey's life I was dismayed not glad for her. 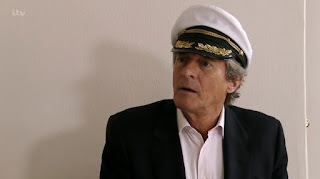 Nigel Havers is lovely to watch, and I enjoy the comedy aspects, but cannot see this ending up any other way than in disaster and heartbreak for Audrey, again. And I don't really want to see that, again.